Thanks for honouring me, is that how you spell it, my spell thingy is switched off. It is very kind of you, I am such a loner I will be hard pushed to find mominees, get out tne rottweilers. Jane, you are the warmest person in which I am very glad to know... I was very uplifted and happy to see your thoughts of me... Gracias, mi amiga! Jane thank you so much for thinking of me... One of the things that was a real pick me up! 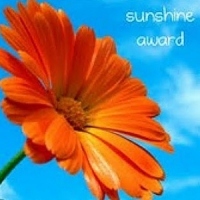 Of all the bloggers that deserves the Sunshine Award is you! Gracias mi amiga!! Thanks yet again! I'm running out of acceptance speeches!